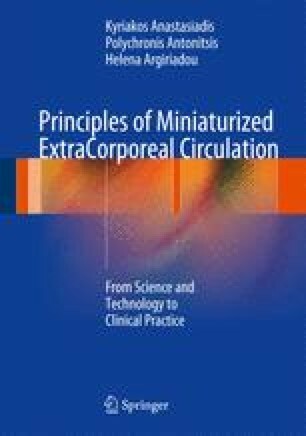 Cardiopulmonary bypass (CPB) has been established the last 60 years from the time it was introduced into the clinical practice back in 1953  as the gold standard technique for performing cardiac surgery. Especially in coronary artery bypass grafting (CABG), CPB creates an ideal setting for complete revascularization because all coronary anastomoses are performed in the presence of a bloodless surgical field. However, it is associated with significant morbidity, related to pulmonary, renal, neurological and gastrointestinal disorders. The underlying mechanisms are multifactorial, including surgical trauma, haemodynamic disturbance and blood contact with the foreign surfaces of the CPB system [2–5]. It is recorded that only about 65 % of conventional CABG procedures reported no complications, and the morbidity of CABG is largely attributed to the use of CPB . This is mainly due to the fact that use of CPB is associated with a systemic inflammatory response. It is already 30 years now when Kirklin et al. reported that the exposure of blood to a large foreign surface such as extracorporeal circulation (ECC) activates the complement system . The contact activation of blood cells with artificial surfaces and air, the operative trauma itself, ischaemia-reperfusion injury, haemodilution and endotoxemia caused by intestinal hypoperfusion are the predominant triggers of complement activation, alteration of the cytokine steady state, alteration of coagulation and fibrinolysis, activation of immune-competent cells and endothelial damage . This leads clinically to a postperfusion syndrome characterised by fever and fluid accumulation in the interstitium . This so-called systemic inflammatory response syndrome (SIRS) is similar to sepsis [3, 6, 10, 11]. Patients who experience severe SIRS often require longer duration of ventilatory support, have increased postoperative bleeding and demonstrate increased capillary permeability leading to fluid shifts and multiorgan failure mainly for the lungs, the kidneys and the central nervous system. The SIRS is complex and can be partly attributed to the non-endothelial lining of the pump tubing, the damage of shed pericardial blood, the cardiotomy reservoir and the blood–air interfaces (it is incited by the wide fluctuations in temperature), and ischaemia-reperfusion injury. Complement activation, neutrophil activation with degranulation and proteolytic enzyme release, oxygen-derived free radical production, endotoxin as well as cytokine release, nitric oxide, endothelin and platelet-activating factor production result in a sustained and amplified SIRS (Fig. 2.1). The clinical manifestation of this inflammatory response varies, while it can be sometimes fatal [13–19].